Cary, NC — Whether you prefer red wines or white, one winery and a handful of markets in Cary carry anything you’d need. We’re lucky to have our own urban winery in Cary in addition to a handful of wine markets that carry fine wines from all over the world at a wide range of prices. Most of our local wine markets carry craft beers, too, and have bars so you can sip a drink while you shop. I visited a couple of these local gems to see what they offer and what makes them distinct. I visited Chatham Hill Winery to talk to Jill and Marek, the owners and founder. “There are so many things that make us special,” Jill said as she told me the story of how the urban winery was born. Before Chatham Hill Winery was even on the map, Marek, a chemist and professor, loved to make wine at home. As a scientist, he enjoyed experimenting, especially with the European style varietal grapes that were starting to grow in North Carolina in the 90s. As an event venue, Chatham Hill can accommodate parties of all sizes. Sure enough, Chatham Hill Winery stayed right here in Cary, and the beautiful yet laid-back space is the perfect place to relax and drink with friends, learn about the wine-making process or host an event or party. Jill and Marek love to teach their customers about wine, so they’ll host fun events where you’ll taste wine in different glasses or participate in blind tastings. Chatham Hill Winery can be set up to host small gatherings and bridal parties or large, corporate functions. In terms of the wine, every bottle sold at the winery is made and bottled on-site by Marek. There’s something for wine-lovers of all tastes, too, including reds and dry reds, whites and dry whites and a series of special fruit-infused grape wines with natural flavors of blueberry, peach and raspberry. Instead of being made with fermented fruit juice, these fruit-infused grape wines result in beverages that are not too sweet but that still appeal to customers who like sweeter wines. Affordability is important to Jill and Marek, too, so all their wine bottles are priced between $15-$25. You can get four-wine flights for $12. You can enjoy live music at the winery every Friday night and trivia nights once a month. 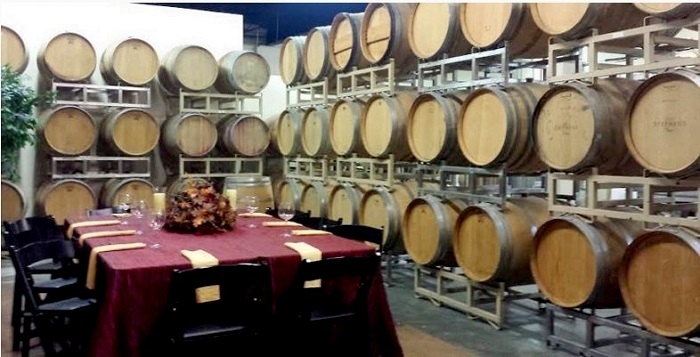 The winery is also open for tastings and tours most days. Can’t get enough wine? You can join the Chatham Hill Winery Wine Club to get bottles of wine and to have access to special events. Check the winery’s Facebook page to stay up-to-date on all events. Not to be confused with Chatham Hill, Chatham Street Wine Market, located right beside Ashworth Drugs on Chatham Street in downtown, is Cary’s newest wine store. I talked to Doug, the owner, to learn more about the quaint shop. Doug and his wife opened the intimate, “boutique-y” wine market last year. The market features wines of all kinds from all over the world and a tasting bar, but what really stands out is its environment. Between the tables at the front of the store to the spacious rooms in the back to the “wine grotto” in the backyard, there is plenty of event space – or space to relax and drink with friends – available. Doug, who has been in the wine business for 10 years now, hand-picks every wine he sells. This wine grotto is lit at night and will be perfect as the weather starts to warm up. Wines are sold by the bottle (Doug likes to keep most prices around $30 or under and many at $15), but customers can also enjoy flights, tastings and community events. Check the Chatham Street Wine Market Facebook for information about events. You can find a little bit of everything at Total Wine & More in Crossroads Plaza. This is another large market full of wine, wine accessories, glassware, craft beer, cigars, novelty gifts, bar tools and even snacks. It’s a great place to find gifts. You can find a large selection of fine wines and craft beer at Triangle Wine Company, which is located next door to Whole Foods in Waverly Place and is also in Morrisville. Stop by the store’s bar to enjoy a $5 glass of wine or one of 20 rotating draft beers on tap every day. The shop carries a variety and quality of wines at every price point from small, local family wineries to small-scale producers from around the world. Eco-friendly wines, wines local to North Carolina, highly-rated wines and new wines are clearly marked to help customers who are looking for something particular. Wine tastings and other events are held weekly, so check the event page for the Cary store to find upcoming tastings and programs. Great Grapes, located in Cary’s Salt Box Village shopping center, is a wine, beer and spirit accessory store that carries a wide selection of wine and craft beer, along with several types of glassware, wine accessories and unique food and cheese merchandise. This shop also holds wine tastings and wine education classes – check the Facebook page for these. You’ll find all kinds of wines, craft beers and wine glasses and accessories at The Wine Merchant in Preston Corners. You can stop by to enjoy a glass of wine or beer (the shop always has four beers on tap) after work or while you shop. What’s your favorite place to buy wine in Cary? Comment below and let us know. Story and photos by Jessica Patrick, except wine grotto photo by Chatham Street Wine Market and lead photo by Jing.